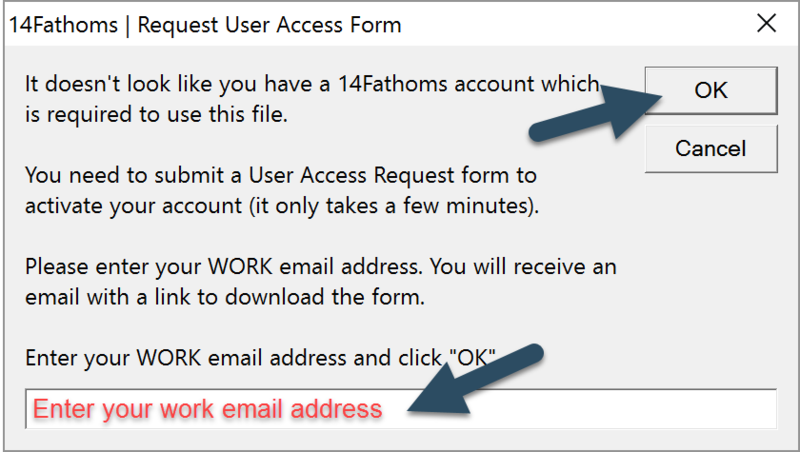 How does a new user register for 14Fathoms access? The new user should open a 14Fathoms product from their work computer and enable macros. 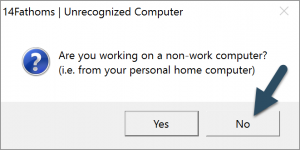 When asked if working from a non-work computer, click “No”. The new user should enter their work email address and click “OK”. The new user should look for an email from 14Fathoms support within two minutes. If an email isn’t received check the spam folder. If the email still isn’t found, contact us. The received email will contain a link to download a registration file. Click the link to download and save the file. Open the registration file and enable macros. The new user will fill in their details and DOUBLE Click the Submit button. A final confirmation email will be sent. The new user should open that email and click the link to activate their account. You can close and discard the registration file and reopen the 14Fathoms product. Contact us with any issues.